RALEIGH – New details about parking, renting and shopping in a new highrise development at the northern border of downtown surfaced Monday. 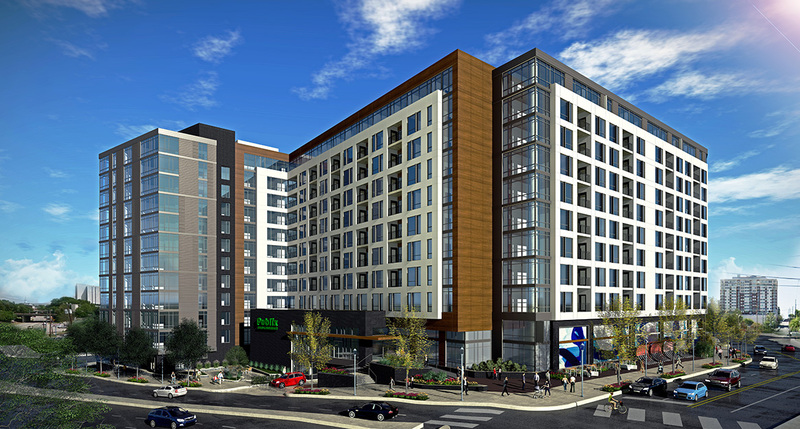 As The News & Observer has previously reported, the project on the southeast corner of Peace and West streets will be anchored by a 45,600-square-foot Publix, with retail and apartments. Now we know how much. The site will feature more than 5,000 square feet of ground-level retail, 417 apartments and a parking deck large enough to accommodate 736 vehicles, according to the financing agreement. In addition, the building will be 11 stories, rather than the 12 previously announced. Kane Realty says construction is expected to be completed in 2020. The project, called Peace, is the first phase of a long-term redevelopment of an area once called Smoky Hollow, that will give shape to an undefined cluster of businesses and houses. It will be near a planned 16-acre city park and greenway project. A hotel, office space and more residential and retail are being considered for subsequent phases. The new details emerged in a financing announcement by the Houston-based Holliday Fenoglio Fowler commercial real estate company. HFF, working on behalf of the partnership of Williams Realty and Building Co. and Kane Realty Corporation, arranged a construction loan with Lionstone Investments, a data-analysis real estate investment firm. The amount of financing was not disclosed. In 2016, the local developers said the project would cost up to $100 million.